Exquisite sights of El Nido's 'Big Lagoon'. Globally protected for its biological and geological diversity, this tiny speck in the Philippines is called Heaven on Earth for good reason. Gary Walsh ­island hopped his way south from Manila to the stunning El Nido – “The Nest” – an idyllic ­island outpost he would find very difficult to leave. You’ve glided past these sudden, cinematic eruptions of karst limestone on a red-rigged junk in Vietnam’s Halong Bay, slalomed between them on a speedboat in southern Thailand, and been paddled serenely along a river in their shadow in China’s Guilin. The thing is, you’ve never been alone. But here you are alone – or as close to it as you’re likely to be in this heavily touristed world. Here, near the northern tip of the Philippines island of Palawan, you have the place almost to yourself. The Philippines attracts fewer visitors than other countries of Southeast Asia, and here at El Nido you can reap the benefit. The seclusion of a Palawan beach. I’d arrived in the island’s main town, Puerto Princesa, from Manila and spent a pleasant day exploring the sights – a whitewashed ­cathedral, a port filled with fishing boats, a couple of lively markets – before jumping on a jeepney for Sabang, a sleepy fishing village close to the Underground River, a UNESCO World Heritage-listed phenomenon. I stayed happily in a bamboo nipa hut on the beach for less than $10 a night, eating fish straight from the Sulu Sea and drinking warm San Miguel beer, watching the light fade until the mosquitoes forced me inside, where I read under a bulb that somehow seemed to make the room darker until the generator spluttered to a stop. The Underground River was fun, and I lolled in a rowboat as I was paddled through spectacular cathedral-like caves and long, dark tunnels, past formations called the Virgin Mary and the Holy Family. This is the Catholic Philippines after all. But El Nido was where I was headed. Flights between El Nido and Puerto Princesa come and go, and I fluked a time when they were operating. The alternatives – seven hours in a roaring, belching jeepney or haggling for a bangka boat with all the imponderables of weather and sea conditions – didn’t seem terribly appealing. The town is a couple of streets by the waterside – a huddle of dusty sari-sari stores, cheap hotels and guesthouses, cafés and hawker stalls, dive shops and tourist offices, with tricycles buzzing everywhere. What makes it memorable is the setting. Over-water luxury at Lagen Island resort. 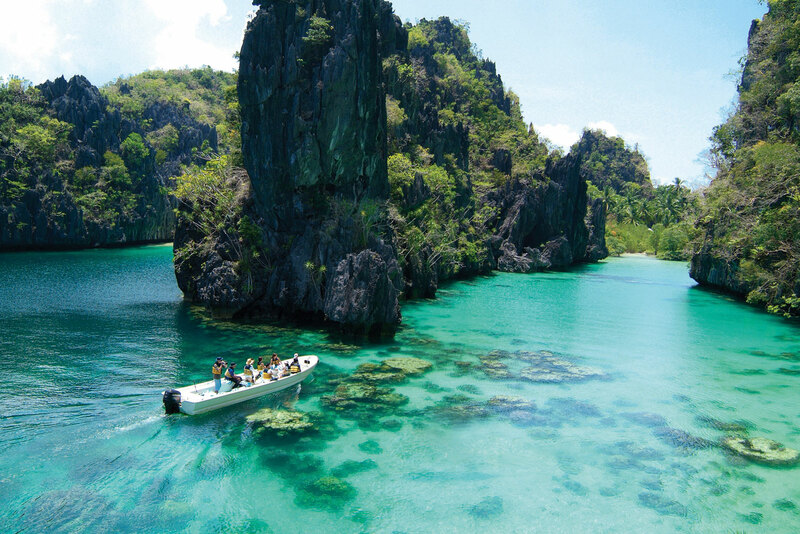 El Nido beach is appealing from a distance, with dozens of elegant bangkas, spidery outriggers rolling gently on the swell, waiting to whisk passengers onto a glorious aquamarine sea. But on closer inspection there’s rubbish on the sand and in the water, and you don’t want to consider what happens with the town’s ­sewerage outfall. Still, just raise your eyes. In every direction there are islands, some rising sheer from the water, green monoliths with occasional tantalising wisps of white sand. To the west are spiralling limestone stacks crested with dense rainforest foliage, and directly behind the town, the Taraw Cliffs. Full-scale climbing is growing around El Nido, but the 230m haul up the cliffs can be done without ropes. Estimates of climbing time range from 45 minutes to two hours, and it’s tough going on the sharp rocks and occasional sheer walls, but the reward is a glorious panorama of Bacuit Bay. I jumped on a bangka for Lagen Island, an exhilarating journey with the boat skipping lightly over the waves and running close to steepling cliffs along a mostly virgin coastline. My Sabang nipa hut was traded for five-star luxury. Island hopping by local ‘bangka’. A giant karst stack looms over Lagen Island Resort. As in southern Thailand, the cliffs hereabouts are home to swiftlets whose nests are harvested for soup – the name itself, El Nido, means “the nest” – but Lagen Island is about preservation rather than destruction, with the resort the sponsor of a range of ­environmental initiatives. It has its own ­nature trail that’s home to a colony of macaques and a profusion of endemic birdlife. Miniloc Island shelters both Big Lagoon, a soaring space with an entrance so shallow that boats often have to be towed through by their wading skippers, and Small Lagoon, the ­entrance to which is wide enough for just one person to kayak or swim through. These are prosaic names for most poetic places. The water is utterly translucent and the bangkas appear to be floating on air. Secret Lagoon is … well, secret-ish, reached by wading through shallow water and then clambering through a metre-wide hole in the rock. There’s squeezing and slithering, too, to enter Cudugnon Cave, a Neolithic burial site of quiet magnificence, shafts of lights illuminating glistening multi-coloured rock curtains. Vigan Island gets its nickname, Snake Island, from a narrow serpentine sandspit that emerges only at low tide and acts as an organic pontoon for swimmers and boats. In truth, it’s partly what you don’t find at El Nido that makes it so magical. No jet-skiing, no parasailing, no banana boats or booze cruises. Just the simple pleasure of chugging along a silvery sea on a bangka at sunset. Exploring the azure El Nido seas. Dry season runs from December to May, with March to May best for diving. Avoid Easter, when Filipinos traditionally return to their home provinces. Philippine Airlines (PAL) flies daily to Manila from Sydney and Melbourne. AirAsia flies daily via Kuala Lumpur. From Manila there are daily flights to El Nido with ITI and three flights weekly with Seair – 10kg luggage limit applies. Philippine Airlines and Cebu Pacific fly from Manila to Puerto Princesa. Jeepneys to El Nido take around seven hours, and there are also bangka boats from Puerto Princesa and Port Barton. Take to the water. Go on day trips or rent your own bangka, but spend your time exploring the islands. Scuba sites abound, although much of the coral is bleached, and PADI courses can be undertaken. Snorkelling is cheap, and many island resorts have small reefs just off their beaches or piers. If you’re staying in town, be aware that El Nido’s electricity officially runs for about 18 hours a day, but don’t bet on it. Visitors to El Nido are charged a 200-peso (less than $5) ecotourism development fee, the proceeds of which are used to protect the environment. If it helps to preserve this extraordinary place, it’s a remarkably small price to pay. Stunning Lagen Island Resort spreads around a horseshoe-shaped bay beneath limestone cliffs. Over-water cottages are prime real estate. Miniloc Island Resort is slightly older and set on a pretty cove, with snorkelling on a reef from its jetty. Both are around 40-45 minutes from El Nido by bangka. Treetops (treetopselnido@yahoo.com) is a little out of El Nido town, which isn’t a bad thing. Simple non-air-conditioned cottages and friendly hosts. Close by is Coral Bay Resort, with decent A/C cottages and rooms on Corong-Corong beach. Smack in the middle of town, the Entalula is a comfortable guesthouse overlooking the beach. Ipil Travelodge El Nido is one street back from the water in the heart of town. Island hopping by bangka. 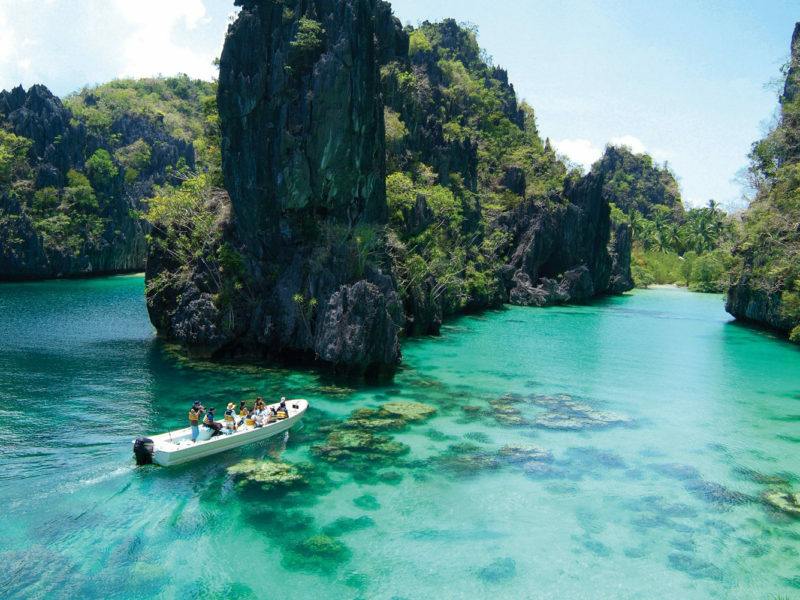 Organised tours abound, but to see El Nido at its best hire your own boat and head out as early as possible. The actual township has little to recommend it other than as a transport hub. Get there, and move on as quickly as possible.